Because of the following excellent properties of tungsten such as high density, high melting point, small volume, excellent hardness, superior wearing resistance, high ultimate tensile strength, high ductility, high temperature resistance, low vapor pressure, gold-plated paperweight, tungsten alloy golden paperweight are the most popular handicraft nowadays. 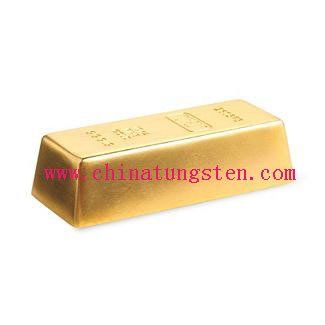 Tungsten alloy gold plated paperweight and tungsten alloy golden paperweight are composed of tungsten heavy alloy. The alloy allows for maximum hardness and rigidity without sacrificing tensile strength. Each gold- plated tungsten alloy paperweight is polished with diamond tools. Hardness, assuring long lasting beauty, permanently polished. Tungsten alloy golden paperweight can be a keepsake or souvenir. Tungsten alloy golden paperweigh or gold-plated tungsten alloy paperweight can be sent as presents of birthday with someone's birth date or name on it.Tungsten alloy golden paperweight, they are also a good choice for New Year and anniversary of company or wedding. Tungsten alloy golden paperweight takes a brilliant high polish and resists scratching longer than any metal ever offered to the public. Gold-plated paperweight and tungsten alloy golden paperweight are about ten times harder than 18k gold and four times harder than Titanium, there fore, golden paperweight will never bend out of shape. Chinatungsten can offer tungsten alloy gold plated paperweight, tungsten alloy golden paperweight as handicrafts, gift, present to our clients. Usually, it could be used as free golden gift for friends, clients, classmates, etc. Also Chinatungsten would like to reminder that please do not use for any illegal purpose, and any engraving letters and/or logos as expected should depend upon the signed guarantee and/or certificate. If you are interest in gold-plated tungsten alloy paperweight or tungsten alloy golden paperweight, please feel free to contact sales@chinatungsten.com sales@xiamentungsten.com, or telephone 86 592 512 9696. Notice: Chinatungsten Online (Xiamen) Manu.& Sales Corp. is a very professional and serious company, specializing in manufacturing and selling tungsten related products for more than two decades. 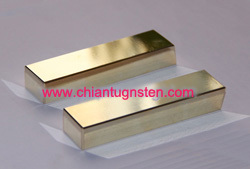 Our gold-plated tungsten alloy product is only for souvenir and decoration purpose. Here we declare: Please do not use our gold-plated tungsten alloy products for any illegal purpose.